The Curiosity.com platform looks like many of the video-based Internet education offerings of this modern day: Upworthy, TED, even MOOC provider Canvas. They really look the same. It’s as if WordPress has but one education design option and everyone is required to use it. From a design standpoint, learning in 2014 equates to a three-column desktop publishing layout, one click promising an equivalent to Neo’s kung fu lesson in The Matrix. 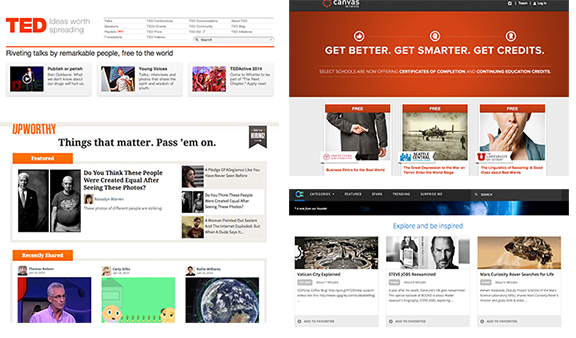 An amalgam of screenshots from education-centric websites — January 14, 2014. There is certainly space for research and discussion of the digital layout of education in 2014; Curiosity.com is just one of many start-ups to follow the dominant paradigm that seems beholden to building freedom of choice through content boxes. Stuart Hall would have a field day with why education is delivered in such a fashion. That is for another time, however. This entry was posted in Uncategorized and tagged cognitive style, Coursera, Discovery, edcMOOC, Gamification, Honey Boo Boo, instructional design, layout, MoMA, television, TLC on January 22, 2014 by Rolin Moe.